Yes, a four foot wide baker’s rack was our kitchen for eighteen months in the Italianate.Â It works better than you might think.Â This picture is after the full-sized kitchen was finally completed, and the rack in the garage where it was waiting patiently to be called back into service.Â (Or moved.Â It’s in storage now. )Â I couldn’t get far enough away to show the whole kit and caboodle. We baked cupcakes for the Little One’s 3-year-old birthday in the toaster oven.Â (We bought a bakery cake from Kirschbaum’s for herÂ 4-year-old birthday.Â By then, I was a month away from moving to Arkansas. )Â We fixed a multi-dish Christmas brunch for seven adults and four children on the rack — except Don fried bacon in the basement.Â On the same electricalÂ circuit as it turned out.Â Lots of one-dish meals due to washing challenges, but lots of good food, too.Â We even subscribed to Angelic Organic’s vegetable service* the first summer without a kitchen and ate up most of their vegetables each week.Â We made pancakes,Â rice dishes, cookies, cornbread, cupcakes, casseroles, roasts.Â You name it, and it’s possible to do if you think about it.Â (Cookies are a pain because I always want to cook more than a handful of cookies.Â It turns out that baking cupcakes or quick bread in series is fine.Â The leavening doesn’t wear out before the loaf goes in.Â Didn’t try yeast breads. )Â I thought it was much easier than cooking over an open fire, in any event.Â Speaking of which, we did very little grilling.Â Not sure why, except that Don is the griller and also the home improver. I hope to add some of my favorite one-dish recipes over the weekend. *Angelic Organic is taking subscriptions for next year.Â Too far for me – I have a local farmer who keeps me in vegetables, but some of you up in Chicago might like to look into it. Â So this is our orphan Italianate, all dressed up and waiting for a new family. * The house genealogy I’ve done confirms my belief that it is considerably older than the 1893 date used in the listing papers. ** (The town incorporated in 1893, so that may be where that date comes from.) The ItalianateÂ style is a bit uncommon for our town. We know of three in the immediate area, while there are dozens of Queen Annes, four-squares, Dutch Colonials, center entry Federals, and bungalows. I assume the relative scarcity is due to the age — by the time our inner Chicago suburb was being developed after the Chicago Fire, Italianates had gone out of style.Â Also, some of the Federal style houses may be Italianates stripped of their gewgaws. 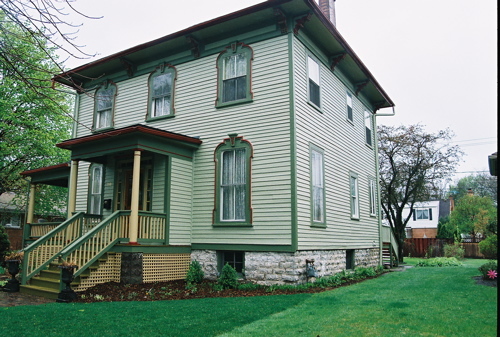 It presently sits on 1.5 lots, and in 1885, it was the only house on the block. The deed from that year refers to a number of lots [6 or 12] sold for a relatively minuscule price, which included a barn and a house. The land and house were sold at auction after the mortgagee defaulted on a loan. 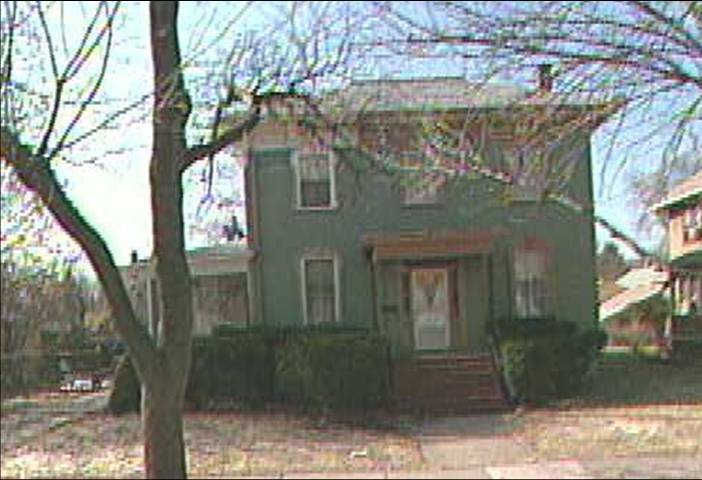 The next house on our block was probably built in 1887, based on the sale of some land to Mrs. Lyon — her house is kitty-corner behind ours. (I’m working from memory because my house genealogy notebook and clippings are in storage.) Her house is a Queen Anne/farm style. Most of the other lots were sold in turn by about 1930, except that our house’s owners kept three lots until about fifty years ago. By the turn of the last century, our Italianate was home to a stone merchant and his family and it probably occupied just those 3 lots. (There was a limestone quarry less than a mile from the house. Our study/dining room has a lovely fireplace with limestone “bricks” which I speculate came from the quarry.) After his death, his wife and children stayed in the house for quite a few more years. Â He was a Christian Scientist, probably a founding member of the local church, and when he died, Avery Coonley*** of Riverside preached the funeral from the house. His widow apparently made something of a living as a professional whistler. 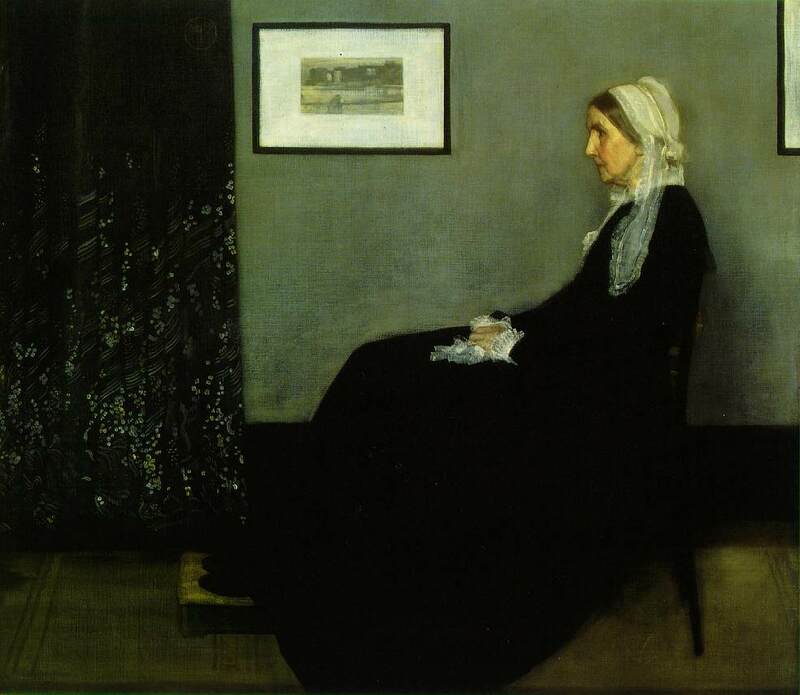 (Not this kind of Whistler, although I understand that his peacocks would have been noisier.) She went to Chautauquas**** and would whistle bird songs and the like. Eventually, she married a minister (Episcopal? American Baptist? I forget, but not Christian Science; it’s written down in that house notebook) and moved back East. 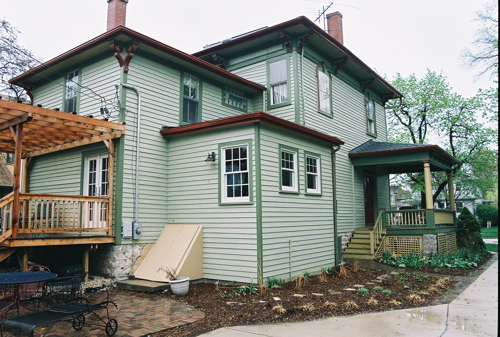 After that family sold the house in the 1920s, it was owned by several (4? 5?) families over the next thirty years. Often, they had a boarder. The second upstairs bathroom was there quite early as there was a clipped advertisement in our house file for a boarder, and it mentioned the private bath. At one point, a piano teacher lived there. Her student concerts were in the double parlor. Then, in the 1950s, the owners sold 1.5 lots (the corner lot plus half a lot) to our present neighbor Caroline who built a nice ranch on it. Just before 1962, the owners remodeled a bathroom or two, installed olive green sculptured carpet throughout the downstairs, and sold it to our immediate-past POs, who lived there until 2005. Mr. PO died in the 1990s, Mrs. PO stayed there another ten years while developing dementia. When we bought the house, she had moved to a nursing facility nearby.Â Several of their children still live in the area, and one lives just a few blocks from us. * We’re hoping our orphan will soon be adopted!Â We have a signed contract with people who had been waiting for their house to be adopted.Â We are in the inspection, attorney review stage.Â The full house inspection is today.Â (Already had bugs inspection and radon inspection.Â They waived lead testing. )Â Will be holding breath until later in the month when/if we close. *** Yes, that Avery Coonley. Don and I have toured part of the Coonley estate during a Riverside house walk. Coonley had Frank Lloyd Wright design it and it was apparentlyÂ Mr. Wright’s favorite Prairie style house. **** My own great-grandmother and her father (my great-great-grandfather) used to play violin at Chautauquas. On the other hand, one dream job, 50% reduction in housing costs (if we ever get to buy), two actual snow days last winter, the Little One getting to know her maternal grandparents and relatives, and the knowledge that we can rehabilitate an orphaned house.Â It all adds up to the knowledge that we can do some pretty amazing things and explains why we’re willing to do it again.